Just booked Baqueira Beret for New Year and now it’s time to do more research and watch the weather/webcams for the next few months. Usually ski the Alps but have only read very good things about Baqueira Beret so thought that we would give it a try for a change. We’re a family and it seems to cater for all levels. Baqueira testing their snow cannons this morning. Certainly snow on the tops when we flew over yesterday. Went in about 2004 I think and had too much snow! Couldn't ski for three out of the six days so be careful what you wish for I'm sure you'll like it though so report back. 30cm at 1500m in BB overnight according to their Facebook page. Still tipping it down on the webcams and more in the forecast over the next few days. Thanks for posting this, I hadn't seen it. It is an excellent resolution of the situation, which was a little bit worrying - for a while I thought we were going to the return to the 'bad old days' of having to decide between Pas and Soldeu. The addition of Arcalis is nice plus too: it is fantastic freeride resort but only really worth going when the snow is fresh. Now it will be possible to go there in the morning to check it out, and if the off-piste is poor then nip across to spend the afternoon on the superior pistes of the 'main valley'. I wonder in the future Pal/Arinsal will get absorbed and the whole thing will become one big happy family? The addition of Arcalis is nice plus too: it is fantastic freeride resort but only really worth going when the snow is fresh. Now it will be possible to go there in the morning to check it out, and if the off-piste is poor then nip across to spend the afternoon on the superior pistes of the 'main valley'. Not the first time money resulted in a strange marriage...! Webcam pictures look lovely today. The snow cannons were pumping out the white stuff yesterday too. Correct, but you have to pay extra to get it included on the Grandvalira pass. So for this year at least Arcalis is still included in the Vallnord pass. (Quite some bit of intervention from the politicians to get Grandvilra agreement not to dissolve). I spent my youth ski-ing in the Pyrenees - 2 weeks every Easter in Les Agudes, on French Exchanges. It was a cycle of rutted ice in the mornings (no piste bashers back then), then slush in the afternoons. Loved it, all the same, and it gave me a love of ski-ing in slush, which persists to this day! The Arcalis website states that it is opening this Saturday (17). Well, I drove up there yesterday to have a look around. It is not looking good. The access road that is usually used for skimo or a green exit run is still wide open. As such I managed to drive up all the way to the La Coma ski-lift. Maybe that is their plan - only open the bowl around the La Coma. IMHO unless one has serious snow withdrawal symptoms it is not worth the money (yet). For someone with a season pass, maybe about three runs just to test out some gear, but nothing to get excited about. Not anymore. Just got news that opening has been postponed to the 24th. That was Masella on the 2nd of November! Extraordinary. They'll be doing a 6-month season again this year - exactly ten years after their last one. It was a bit of a flash in the pan, though, as the high temperatures of the last couple of weeks have meant that they're now down to 16km open... although that's certainly not too shabby for the time of year. Indeed they're still the only resort on offer at the moment, although it's starting to snow in the eastern Pyrenees right now and so perhaps there will be other options available next weekend. Hopefully things will get going soon! Looks like quite a number of of tracks on the 2nd pic. Did you see many other early birds? Yeah actually it was quite busy! 3000 people on Thursday the 1st, which was a bank holiday in Spain and elsewhere; I had to wait until the next day, because I've taken out the weekdays-only pass for Alp2500 (Masella and La Molina) this year. (*) Over the four days of that long weekend, they apparently had 16000 visitors, albeit that many will have been season ticket holders. That's Masella's business model though: they sell more season tickets than any other Pyrenean or Iberian resort - in the order of many thousands - on the back of offering the longest season and a decent book of invitations for other resorts. Over that weekend they had half of the resort fully open, and it was a fun atmosphere. The off-piste up top was as good as on any day in mid-winter! (*) which - when you buy it through Masella rather than La Molina - comes with the same invitations book that you get when you buy the Masella season ticket alone. In fact, that was the main reason for choosing that pass this year... I've now got day tickets for 10 different resorts in the eastern Pyrenees, plus a couple of central/western resorts in the French Pyrenees as well as two days in Sierra Nevada, plus an handful of multi-day passes for lesser-known places in the Alps, plus some even further flung places which unfortunately I certainly won't be able to visit. And at the weekend my plan is to spend as much time as possible off the beaten track... Puigmal is my first target! Despite the optimistic opening dates for most Pyrenean resorts, the snow looks to be thin on the ground at lower altitudes. Aim high! (*) I have no connection to it whatsover other than as a punter, just as on here. BTW I feel a bit ashamed for not having given cheeky little Port Ainé the props it deserves in my earlier post! After all, it's entirely above 2000m too, except for that sweet pisted (and cannon-fed) black that winds down from the main base through the forest to the lower bend of the road. It's another area which will have a fantastic start to the winter. Indeed, at lovely Port del Comte they reckon they'll open everything this weekend if they can get the cannon snow to stick on the lower slopes (despite the 20-minute detour that's currently needed as they continue to clean up the mudslide that's currently closing the main route up). And hectare-wise it is not a small place! But IMO it's a big if... temperatures are sky high today. Apparantly Arcalis is opening tomorrow. It looks like they are dead keen to open before any other Andorra resort. The ski and snowboard season has arrived in Baqueira Beret with a seasonal start according to the forecasts and much of the central area of Baqueira open for those who want to get rid of the irrepressible desire to slide on the snow after a warm summer And a fall with a high precipitation. 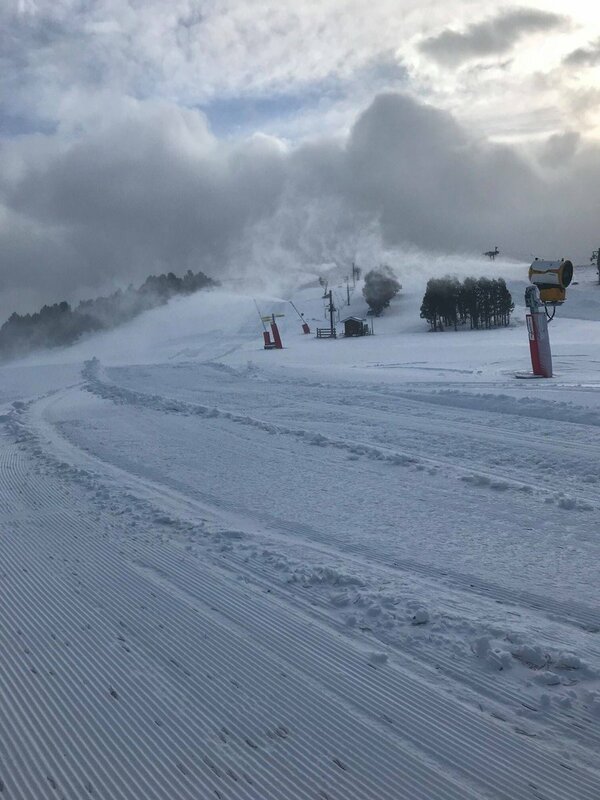 Among the heavy snowfalls in early November, which left important thicknesses in high altitudes, and the snow production of the last weeks is expected to open 27 km of slopes all in the area of Baqueira. The thicknesses are currently 30 cm in 2500 and 15 cm at 1800. The openings for the premiere will be gondola Baqueira, TSD Mirador, Tsd Pla de Baqueira, Cintas Carreretes 1 and 2 in the area of beginners and TSD Jorge Jordana that will give access to the entire North face. The station will keep its operation open during the week in a stable way, if the weather allows it, until the scheduled closing date that is April 22nd. The station's technical managers are working to make possible the opening of more tracks and lifts facing the December bridge. In terms of restoration, the Self Service Café Bosque, the Parrec D'Orri and the Möet Winter Lounge restaurant will be open with DJ Luca Feller cheering the terrace and the establishment with more atmosphere après ski will be opened, the Bar Baqueira 1500. With regard to the ticket office, you can purchase the ski pass in the galleries of Ruda, and the 1500 central offices. The price of the ski pass will be special for the occasion of €31 Adult Day and €21 infantile day. With regard to the rental and sale of equipment, the Ski Service stores of 1500, Ruda and Bosque will be operational. In addition to the rental and preparation and repair of material with two new machines of last generation, in Baqueira Store of Ruda it is possible to acquire everything necessary for the winter. During this weekend you will be able to hire the practical services of ski-guard and boots, for the whole season, located in Ruda, Baqueira 1500 and Baqueira 1800.
ysb33r, that doesn't surprise me! Quote rightly, they're going full out on the premise of being the [Arc]Alaska of the Pyrenees. Small place, doesn't get much press coverage outside of freeride circles, ... The notoriety of being an early-opener late-closer does it the world of good. Can't wait to pay it my first 2018-19 visit! JoyZipper, BB will be on fire at NYE... You'll have a blast! iainm, great pics of Les Angles! They'll have a fine first weekend. Lovely place. Thanks - looking forward to it - we have never skied the Pyrenees before. I've got a bit of travelling to finish off before getting into the mountains. Should be at La Mongie for the weekend of the 15th of December for the first turns of the season. Looking forward to checking out the changes for 2019, particularly the new lift in Baqueira. Indeed, we've been spoilt the last few seasons with great conditions on this long back holiday weekend, but we were due an iffy one. You won't find much stoke on the webcams at the moment, but the resorts are doing the best they can. Masella, Boí, Port del Comte, Baqueira, Cerler and Vallnord each have some 30km open, and other Catalan resorts have some reasonable skiing as well. Grandvalira has managed to get up to 50km, but even so they had to stop selling walk-up passes for the weekend due to the place being dangerously overcrowded. None of the other Aragonese resorts have been able to put in a showing, nor have the large majority of French resorts. Given that the snow came from the south and east, the places which look the most wintery are Boí and Cerler without doubt. Baqueira is a bit of a miserable sight. But still, that can all change as soon as the next storm hits, which could be next weekend. There's still plenty of time for things to improve before the Christmas period. Baqueira pumping out the man made snow on the upper mountain this morning. That's right; the drop in temperature means that the reservoirs which power the snow cannons are getting something of a battering right now! I heard that thus far in the season Grandvalira has already used 50% of the water reserves that it had planned to use for the entire winter All because of this darned "Constitution" bank holiday weekend! The joke is already doing the rounds in Spain that whenever they sign off the next version of the Constitution they had damn well better do it in March. Just like in the Alps, there's no tradition of starting the ski season before Christmas.